Used to be gentlemen of a certain age taking this pastime every day, with neat green grass pathways and rows of vegetables. Taking time to 'brew up' and sup the tea with their allotment friends. They are still around, but in the last few years the 'younger' generation have realised, that growing your own food does taste good - you know what's gone on it. With properties of today having such small gardens our local allotment 'is booming'. Families and teenagers now have their 'plot' of land.Margaret hard at work... Every allotment is different, individuals all have their own styles, some more makeshift than others. With glasshouses and sheds appearing overnight. 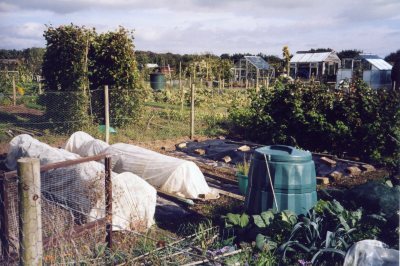 Our allotment size is 10 rods, which in old money is 80ft long and 30ft wide, a number of people have half size allotments. There are now around 140 pitches here. Although the Council owns the land and takes the small annual allotment payment, it is basically run by the voluntary Allotment Association. A list of Rules is issued, not always fully obeyed. Someone always seems to have a bonfire going, blowing our way. The Association has a shop to buy gardening items, open each Sunday morning. Each year a seed company issues a huge list to the Allotment Association available for members to spend choosing next years crop. Also supplied are onion sets, seed potatoes and fruit trees. 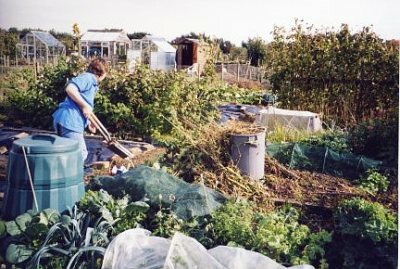 When we first started the allotment over 10 years ago the fun was to try everything. However, we now only grow vegetables and fruit that we like, suitable for our climate and situation. Some of our current favourites are - Mangetout/Sugar Snap Peas, Stringless Runner Beans and Spaghetti Marrows. Moles - funny little burrowing creatures - they seem to build tunnels under Runner Beans. You only notice when you are watering and a steep underground cave appears, all you see is the runner bean roots hanging on for dear life. We were blaming the pigeons for the peas being attacked. However, our next door allotment holder said they had chased off around twelve Jackdaws. Obviously they like Mangetout! So always put in more than you will actually need, one for you and several to feed the wildlife!